There are 217 articles specifically referring to this gene in PubMed. Functionally, the gene has been tested for association to diseases (Alcoholism; Attention Deficit Disorder with Hyperactivity; Autistic Disorder; Bipolar Disorder; Breast Neoplasms; Carcinoma; Cell Transformation, Neoplastic; Cholesterol, HDL/blood*; Chromosome Aberrations; Chromosome Disorders and 11 others), proposed to participate in pathways (Acute myeloid leukemia, Degradation of the RAR and RXR by the proteasome, Map Kinase Inactivation of SMRT Corepressor, Nuclear receptors coordinate the activities of chromatin remodeling complexes and coactivators to facilitate initiation of transcription in carcinoma cells, Pathways in cancer, Regulation of transcriptional activity by PML, Transcription Regulation by Methyltransferase of CARM1) and processes (cellular response to estrogen stimulus, negative regulation of gene-specific transcription, positive regulation of binding, positive regulation of cell cycle, positive regulation of cell proliferation, positive regulation of gene-specific transcription, positive regulation of transcription from RNA polymerase II promoter, regulation of transcription, DNA-dependent). Proteins are expected to have molecular functions (metal ion binding, protein domain specific binding, steroid hormone receptor activity, transcription coactivator activity and 2 others) and to localize in nucleus. 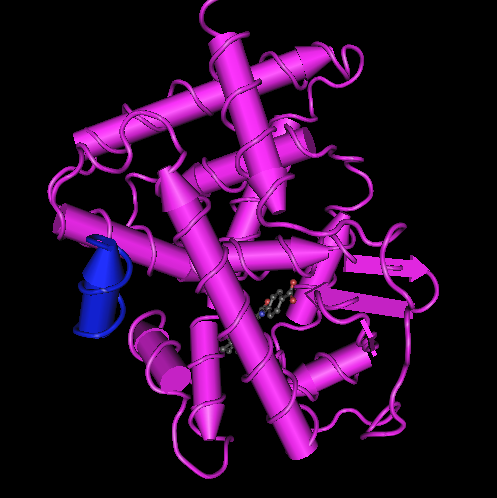 Putative protein interactors have been described (ANP32A, ARNTL, BAG1, BTG1, CCND3, CDK7, CLOCK, CNOT1, COPS2, ESR1 and 58 others). The principle application of this assay product is in the screening of test samples to quantify functional activities, either agonist or antagonist, that they may exert against the human retinoic acid receptor. This kit product is an all-inclusive assay system that includes, in addition to RARα Reporter Cells, two optimized media for use during cell culture and (optionally) in diluting the test samples, a reference agonist, Luciferase Detection Reagent, a cell culture-ready assay plate, and a detailed protocol. The gene contains 22 distinct gt-ag introns. Transcription produces 17 different mRNAs, 14 alternatively spliced variants and 3 unspliced forms. There are 7 probable alternative promotors, 3 non overlapping alternative last exons and 7 validated alternative polyadenylation sites (see the diagram). 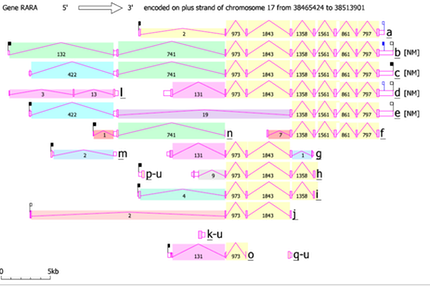 The mRNAs appear to differ by truncation of the 5' end, truncation of the 3' end, presence or absence of 7 cassette exons, overlapping exons with different boundaries, splicing versus retention of one intron. 1103 bp of this gene are antisense to spliced gene sneyvybu, raising the possibility of regulated alternate expression. 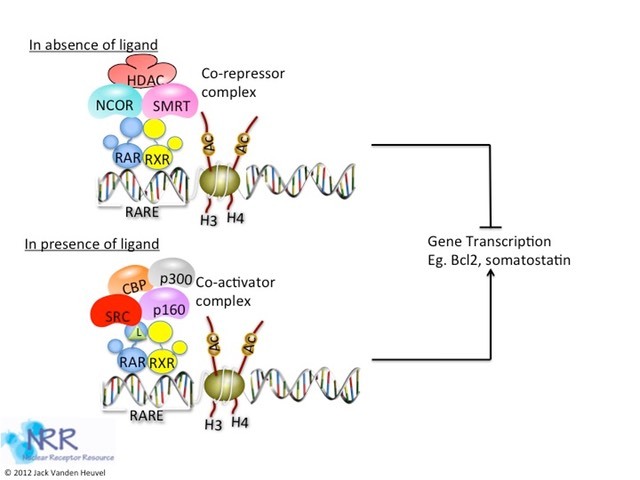 Efficacy of translation may be reduced by the presence of a shorter translated product (uORF) initiating at an AUG upstream of the main open reading frame (in variant bAug10, cAug10, eAug10, gAug10, hAug10, iAug10).